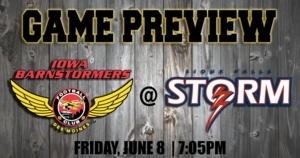 DES MOINES - The Iowa Barnstormers (10-2) visit the Sioux Falls Storm (9-3) in Sioux Falls, South Dakota on Friday, June 8, 2018. The game is scheduled for 7:05 p.m. CST at Denny Sanford Premier Center. Last week, the Iowa Barnstormers took over first place in the IFL after defeating the Arizona Rattlers 41-38 in Des Moines, Iowa. Quarterback Drew Powell had two passing touchdowns as well as two rushing touchdowns of his own, while wide receiver Brady Roland recorded two receiving touchdowns. Defensive back Jourdan Wickliffe led the defense with six tackles and a pass breakup that helped secure the Barnstormers victory, earning IFL honors as Defensive Player of the Week. Last week, the Sioux Fall Storm (9-3) defeated the Green Bay Blizzard (2-10) in Green Bay, Wisconsin. Quarterback Lorenzo Brown recorded five passing touchdowns and one rushing touchdown, while wide receivers Judd Harrold and Lyle McCombs both collected two receiving touchdowns. Defensive back Trey Wafford led the Storm defense with nine solo tackles. Fans can watch the Iowa Barnstormers take on the Sioux Falls Storm on Friday, June 7 live on YouTube or tune in to our live game broadcast on WHO Radio 1040 AM. The Iowa Barnstormers will be back in action at Wells Fargo Arena in Des Moines, Iowa on Saturday, June 16 when they take on the Cedar Rapids Titans. Tickets to the game are available for as low as $12. Call 515-633-2255 for more information.